In order to be solvent, the government must be ready to back up the existing amount of debt with either future seignorage, or with taxes. More formally, the current debt must be equal to the discounted present value of all future revenues from taxes and/or from seignorage. If the government implements a stabilization scheme, such that the revenues from seignorage go to zero, and it has some outstanding debt, it must raise taxes sooner or later. If the government does not change its fiscal policy, it must go back to printing money at some point. This is why in the experiences of hyperinflation the fiscal reform made the stabilization program more credible. Inflation can begin also without growth in the money supply, if fiscal policy induces people to believe that deficits will be monetized. 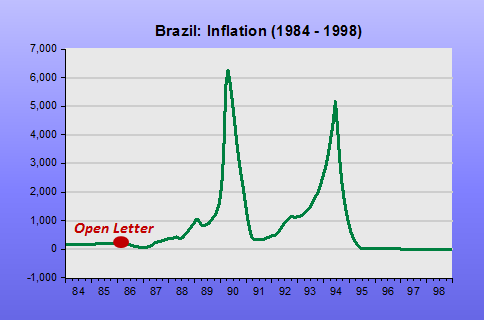 The chart shows what happened to inflation shortly after Sargent´s Letter. After trying to “control” inflation by freezing prices, the (hyper)inflation process became much more acute (yes, that´s thousand %!). The government was only successful in “eliminating” inflation after 1994, with the introduction of the Real Plan. Fast forward almost 3 decades. 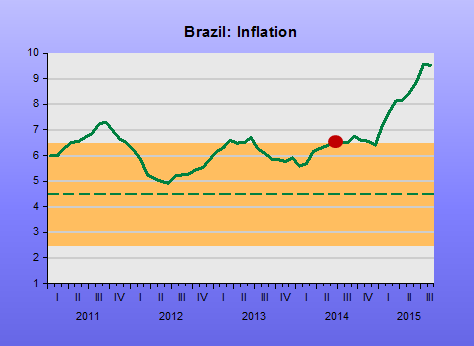 For the last fifteen years Brazil been an inflation targeting country. Since 2004, the mid-point of the target range has been 4.5%, plus or minus 2.0%. So it´s a wide band. 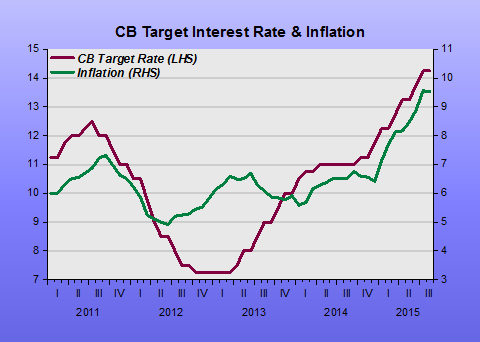 Even so, over the past several years the Central Bank has barely managed to keep inflation within the band, and more recently, the “genie has escaped from the bottle” completely. We seem to be back to Sargent´s worries of 1985. Since April of last year, the primary surplus began to fall dramatically, more recently turning into deficit. With that, the nominal deficit (which includes interest payments) ballooned. The result has been a steep and fast rise in the public debt/GDP ratio. 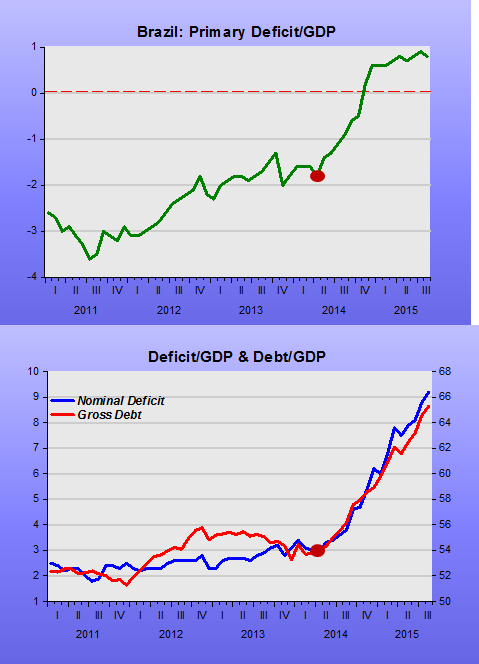 The political background is inimical to the introduction of a credible fiscal adjustment. Therefore, higher inflation is inevitable. In other words, the central bank is fast loosing the power to control inflation. Worse, the more it tries, by raising interest rates, for example, the higher inflation rises, since the increase in interest rates worsens the debt dynamics, requiring more inflation to produce the requisite seignorage revenues (in addition to reducing the present value of real debt through a rise in the price level). This is shown in the next chart. This entry was tagged Inflation, Thomas Sargent, Unpleasant Monetary Arithmetic. Bookmark the permalink.